This groundbreaking musical trio seamlessly blends flamenco, Latin, and jazz in music and dance with a cast of world-class artists from around the country who are rooted in a variety of musical genres. 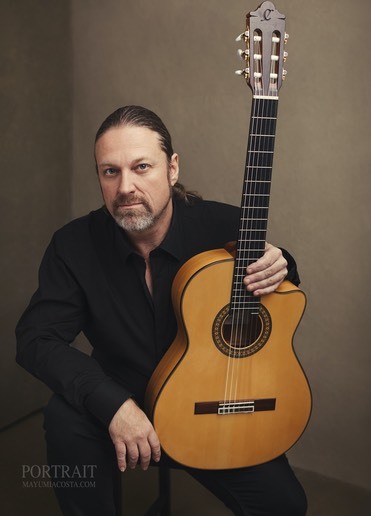 Lead by virtuoso, award-winning flamenco guitarist Jason McGuire “El Rubio,” these three musicians take you on a musical journey that is undeniably an experience of incredible showmanship and passion that has ignited audiences ever since their debut in 2014. With powerful musical direction fueled by Jason McGuire’s inspirational compositions, they have shown they can play both jazz clubs and concert halls while maintaining the essence and improvisational quality of both a flamenco or a jazz group. With Jason on guitar, Marlon Aldana on drumset and cajon, and Paul Martin Sounder on upright bass, the group has already been nominated for a prestigious Bay Area Izzie Award for Best Ensemble.